A tablet running Windows RT easily boasts a full day of battery life, and sometimes two. Tablets running Windows 8, by contrast, last only about five hours between charges. But whether you own a power slurper or a power gulper, your tablet’s battery life always remains a concern. Roughly half of your tablet’s battery strength goes directly to your tablet’s screen. That’s why most tablets come set to turn off the screen when they haven’t been touched for a minute or two. It’s easy to control your screen brightness whenever it looks brighter than necessary. By dimming the tablet’s screen to the lowest point that still meets your needs, you can extend your battery life even further. Slide your finger in from the screen’s right edge to open the Charms bar, and then tap the Settings icon. When the Settings pane appears, tap and hold the Screen icon. As you touch the Screen icon, it turns into a sliding bar for changing the brightness level. With your finger, slide the bar up to increase the screen’s brightness; slide it down to decrease the brightness. As you work on your tablet, keep an eye on the light around you. As the light fades, lower your tablet’s brightness accordingly. Dimming your screen manually is especially important if you’ve turned off your tablet’s adaptive brightness. Anything plugged into your tablet’s USB port — mice, portable drives, portable music players, and flash drives — treats that port as a power outlet, draining power to light up, spin, or transmit information. Portable hard drives and CD/DVD drives are some of the worst offenders. To preserve battery life, try to copy necessary files onto your tablet before hitting the road. Then keep the portable drive stashed in your bag to be used only during emergencies or when you’re plugged into an outlet. When the PC Settings screen appears, tap the Wireless section, and tap the toggle switches for the wireless services you want to turn on or off. Depending on your tablet, that section includes toggles for Wi-Fi, Bluetooth, GPS, or other services. Tapping a toggle switch reverses its setting, so repeat these steps to reverse your actions. 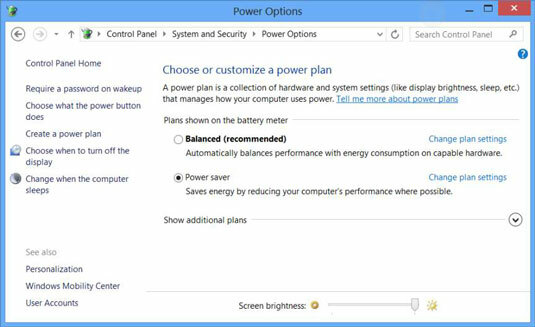 Microsoft designed Windows 8 tablets to conserve as much power as possible. For example, your tablet goes to sleep when you haven’t used it for a while; it doesn’t turn off completely. Normally, that’s exactly how it should be, as it lets your tablet turn back on more quickly when needed. Tablets running Windows RT can sleep for days, even weeks. You don’t ever need to turn them off. They drift off to sleep by themselves when neglected, and wake within seconds at the press of the power switch. From the Start screen, open the Desktop app. Fetch the Charms bar by sliding your finger in from the screen’s right edge, and then tap the Settings icon. When the Settings pane appears, tap Control Panel from the top. This power setting wrings the most life out of your battery by dimming the screen after one minute, and turning it off if you haven’t touched it within two minutes. To turn off your Windows 8 tablet, fetch the Charms bar by sliding your finger inward from the right edge, then tap the Settings icon. When the Settings pane appears, tap the Power icon and choose Shut Down.